I'm definitely more certain about my groom than my dress. Regarding picking out a dress, I've heard a lot of people say that "you'll just know it." I haven't had that aha moment. Instead I've had four "ohhhh, I really, really love this one" moments at four different stores. I went to one last bridal shop today. Now I am cutting myself off. I have four beautiful dresses in the running and the more I look, the more I realize how good the choices I already have are. As one sales lady said to me "The more you look, the more confused you'll get." Plus, I must admit that it's not as fun to look without my mom and sister. One thing that I've been pleasantly surprised about is the pricing of the dresses. The cheapest dress in the running ($250!) is the one I would have guessed by the look of it to be the most expensive. I know it's not polite to talk about money, but since I know virtually nothing about weddings, I was worried about finding something beautiful for a good price. I am proud to say that my wedding dress options are all both affordable and beautiful. 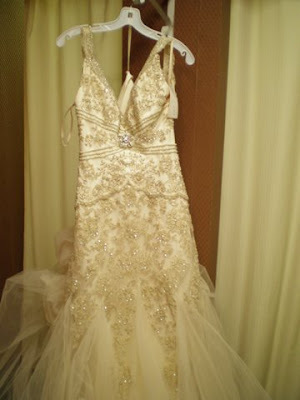 Ladies if you are looking for dresses Casablanca, Jasmine Bridal, Maggie Sottero and Pronovias make fabulous gowns for very reasonable prices. So as you can see, I included a few artsy shots I took today. 1. I'm still infatuated with my ring, obviously. 2. Could this be the one? 3. This is not the one, but it was beautiful. And I liked the way the photo turned out.